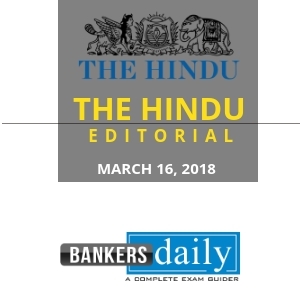 Why Reading THE HINDU EDITORIAL will give you an added advantage in the Banking Exams? English is easy and to read better and to speak better , Language proficiency is important and apart from that scoring more in the exams will pave way to lead a better one. So preparing for the english section with THE HINDU EDITORIAL gives the much needed push for the preparation. 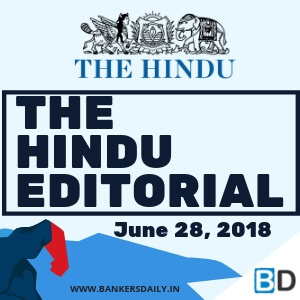 Aspirants can check the video of THE HINDU EDITORIAL for the May 11 , 2018 today @ 6:00 P.M in our Youtube Channel. If — and that’s a big if — the leaders of the U.S., China, South Korea and North Korea succeed in concluding a deal on the denuclearisation of the Korean peninsula as well as on a peace treaty formally ending the Korean War, they would be front runners for the Nobel Peace Prize. That deal could appropriately be called a Joint Comprehensive Plan of Action (JCPOA) if it lays down a detailed blueprint for denuclearisation, with provisions of intrusive inspections. The only thing that could stand in their way is Iran. There should be little doubt that U.S. President Donald Trump’s real, but of necessity undeclared, objective in withdrawing from the Iran nuclear deal is a regime change in Tehran. This goal is even more ardently desired by Israel and Saudi Arabia. Ever since Iranian President Mahmoud Ahmadinejad made particularly provocative statements about Israel, Israelis of all political persuasions have wanted to get rid of the regime in Iran. The Saudis have openly called for cutting off the head of the (Iranian) snake. Thus, three important and powerful states have a congruence of interests seldom seen in recent times. There have been frequent and persistent reports in the Western media for several months about large-scale demonstrations and protests by Iranian people against the regime. Living conditions are difficult. Iran did not get the goodies that it expected after signing the JCPOA. Inflation is high. The Iranian rial is trading at 75,000 to the dollar. People are angry with the government. According to the well-researched work Democracy in Iran: Why It Failed and How It Might Succeed by American academic Misagh Parsa, disaffection among the people has manifested itself in several forms. Hundreds of mosques do not have imams and the attendance at Friday prayers has dwindled dramatically. Some are converting to Christianity and, according to Professor Parsa, even to the Baha’i faith, which is the largest non-Muslim community in Iran. Professor Parsa states that there is massive corruption as well as economic inequality in Iran. All in all, he suggests that it is quite likely that there might be a revolutionary upsurge, though he is careful not to indicate any timeline for it. It is this discontent that Mr. Trump might be counting on tapping. His calculation seems to be that the reimposition of severe sanctions would render life very difficult, almost unbearable, for the populace who might, in the absence of other avenues, take to the streets, as they did in 1979 to overthrow the Shah’s regime which too, like the present one, had strong military and oppressive secret services such as the Savak but which could not defeat public anger, frustration and rage. For these reasons, Mr. Trump is unlikely to listen to voices of reason or to appeals from his Western allies. He is equally not likely to grant exemptions from sanctions to any country engaging in any form of trade and other transactions with Iran. His administration will follow strict interpretation of the guidelines regarding the sanctions regime. Iran has shown restraint, forsaking knee-jerk reaction. It did not declare that the deal was dead, as it might well have done. It did not announce immediate resumption of uranium enrichment, which it emphasised will be at the industrial level. It has so far not called off International Atomic Energy Agency (IAEA) inspections. Iran will consult with the other signatories to the JCPOA for several weeks before taking any further action. This shows the maturity of Iranian diplomacy. It remains to be seen how long France and others will stick to their position of continuing to adhere to the deal; they will eventually have to fall in line in some way with the Americans, if not for political then for economic considerations. For Mr. Trump, the Republicans are fully with him and the Democrats will be too eventually. Will Iran live up to the American calculation? For the present, Mr. Trump’s decision has strengthened the hardliners. President Hassan Rouhani, regarded as a moderate, has no option but to take a defiant stance. The Iranian people, proud as they are of their heritage, will stand behind their regime. But there may come a time when their hardships reach a stage when they might feel compelled to take to the streets. In the meanwhile, Iran will even more vigorously support the Bashar al-Assad regime in Damascus, in which it will be joined by Russia and Hezbollah, which has done very well in the parliamentary elections in Lebanon this month. The Houthi rebels in Yemen will feel more emboldened to take on the Saudi-led coalition; of course, the Yemeni people will continue to suffer, as will the Syrian people, for years to come. Iran will more directly intervene in Iraq and render the possibility of progress in the non-existent peace effort in Afghanistan even more difficult. If the regime in Tehran does not collapse, the Washington-Jerusalem-Riyadh axis might look for an alternative course of action, not excluding military. In that case, the Nobel Peace Prize will elude Mr. Trump. Prime Minister Narendra Modi has established special relationship with Israel and its present Prime Minister, Benjamin Netanyahu. He has also made efforts to forge intimate relations with the U.S. With both India has the upper hand, since it is they who want to sell expensive military hardware to India. Under the circumstances, India has made a well-drafted two-sentence statement on the Trump decision. The first strikes a balance between Iran’s right to develop nuclear energy for peaceful purposes as also the international community’s concern to ensure that its nuclear programme remains strictly peaceful. The second sentence contains implicit disapproval of the American decision and warns, again implicitly, against any strong military action. For India, the question will also be: can it rely on the U.S. to honour even its written word embodied in international agreements? Mr. Trump wants to annul every single achievement of his predecessor — Obamacare, the North American Free Trade Agreement, the Trans-Pacific Partnership, the Paris Agreement, and now JCPOA. India will have to remain vigilant in dealing with this administration; it would not be prudent to assume that it is a special case. The impact on India will be severe. The price of crude is already close to $80. Energy imports from Iran will become difficult and expensive. Fuel prices will go up. The Reserve Bank of India might have to increase interest rates to contain inflation and step in to check the fall in the rupee’s value. All this might have a direct bearing on politics, given the fact that the government was the beneficiary of low crude price for the first four years but may have to face consequences of inflation and attendant factors in its fifth. India’s e-commerce market, which accounts for less than a tenth of its overall retail opportunity, has just got a significant thumbs-up from American supermarket giant Walmart. It has announced a plan to buy a controlling stake of around 77% in home-grown e-commerce firm Flipkart for a sum of $16 billion. In the process, Walmart has pipped rival Amazon, which is just behind Flipkart when it comes to its share of the Indian e-commerce pie and has independently been vying to acquire the Bengaluru-based company. China’s Alibaba, with its investment in Paytm Mall, is vying to compete in the space as well, along with the likes of Snapdeal, which around this time last year was being linked to a much-speculated merger plan with Flipkart. But the big battle for Indians’ e-tail space, for now, will play out between two of America’s biggest companies. Not surprisingly, traditional retail players have responded with willingness to adapt to this paradigm shift and consider strategic alliances with online rivals. Interestingly, Walmart investors have voted against what they saw as an expensive bet, with the firm losing about $8 billion in value on the bourses after the deal was finalised. Though e-tail may have changed shopping habits among swathes of Indians, it remains heavily dependent on discount-peddling. Flipkart, in particular, has reported accumulated losses of ₹24,000 crore. Walmart is betting on the future growth it can unlock from this full-frontal entry into a market that has proved difficult despite its best attempts for over a decade. The company had entered India in 2007 but exited the joint venture with the Bharti group and restricted its operations to cash-and-carry stores, in the face of strict curbs on foreign direct investment (FDI) in the multi-brand retail sector. These restrictions, ostensibly to protect smaller retailers, have remained in place under the NDA government, belying expectations of a reset. Facing heat at home from Amazon, which is now moving from online-only to a brick-and-mortar plus e-tail model, this is a vital time for Walmart to get into India’s business-to-consumer segment. That this deal doesn’t ruffle extant policy restrictions, in fact, reveals the inefficacy of India’s approach to retail FDI in a rapidly changing global marketplace. Local trade lobbies as well as swadeshi advocates are determined to resist the deal, while analysts are wondering how Walmart will turn around Flipkart’s cash burn rates. However, for India’s policymakers, neither of these should matter. It is important to assess if, and how, the U.S. firm will integrate Indian suppliers into its international operations. Most importantly, it is time to nuance the debates that have dominated India’s retail FDI policy — big versus small, local versus foreign — to create a truly level playing field where all can compete, without artificial safeguards that can be overcome via such deals. Meaning: To remove nuclear weapons from a place. Meaning: To officially establish a rule, or to officially state the way in which something should be done. Meaning: Affecting someone in a way that annoys them and makes them feel uncomfortable. Meaning: Very enthusiastically or passionately. Meaning: Agreement or harmony; compatibility. Meaning: An upward surge in the strength or quantity of something; an increase. Meaning: Exploit or draw a supply from (a resource). Meaning: The action of imposing something, especially a law or regulation, again after a lapse. Meaning: Cause to be or become; make. Meaning: Inflicting harsh and authoritarian treatment. Meaning: The feeling of being upset or annoyed as a result of being unable to change or achieve something. Meaning: (Of a response) automatic and unthinking. Meaning: The action of beginning something again after a pause or interruption. Meaning: The action of improving or enhancing the quality or value of something. Meaning: Take part in something so as to prevent or alter a result or course of events. Meaning: Escape from or avoid (a danger, enemy, or pursuer), typically in a skilful or cunning way. Meaning: Keeping careful watch for possible danger or difficulties. Meaning: Acting with or showing care and thought for the future. Meaning: To be connected or related to something. Meaning: An indication of satisfaction or approval (or of rejection or failure). Meaning: Compete eagerly with someone in order to do or achieve something. Meaning: Invest in stocks, property, or other ventures in the hope of gain but with the risk of loss. Meaning: A fundamental change in approach or underlying assumptions. Meaning: A stock market in a non-English-speaking country, especially France. Meaning: A large part of something that includes several different things. Meaning: Promote (an idea or view) persistently or widely. Meaning: Fail to fulfil or justify (a claim or expectation). Meaning: Disconcert or upset the composure of (someone).